Surgery to fuse the cervical spine. 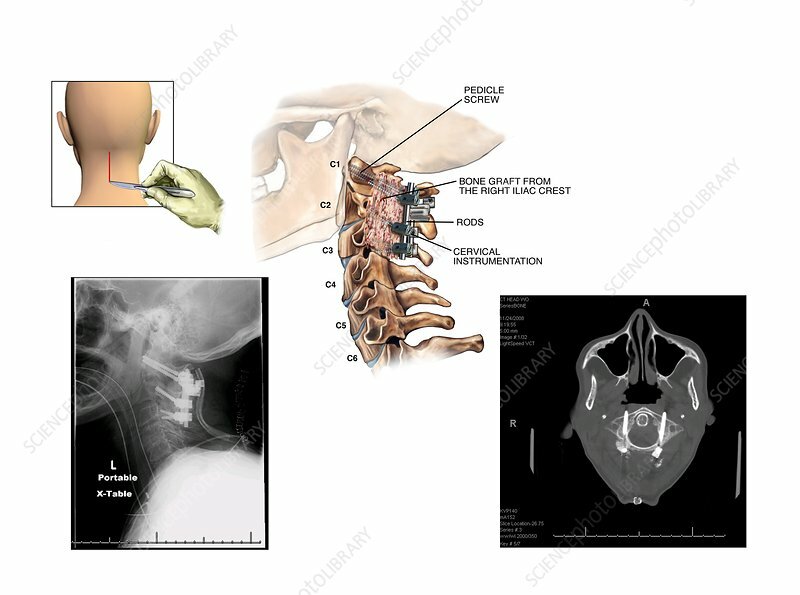 Labelled artwork (left lateral view) showing the implantation of metal implants during an operation to fuse part of the cervical (neck) spine. At top left is a view of the midline incision in the back of the neck made to start this operation. Post-operative scans such as the lateral X-ray (lower left) and axial CT scan (lower right) ensure the implants have been positioned correctly. The fusion was of the upper three cervical vertebrae (C1, C2, and C3). Pedicle screws were used to fix rods to the vertebrae, with bone grafts (from the iliac hip bone) implanted to fuse them. This is done to halt collapse of the spine.